Dramatically increasing number of data breaches was one of the highest priorities facing IT managers, business owners and regulators in 2015. Among the top causes of sensitive data leaks is an increase in targeted attacks that use more advanced techniques to bypass security mechanisms. For the January issue of Sysadmin Magazine, we’ve gathered the best articles about network and data security and some fresh technical tips from IT pros. You’ll find expert predictions on seven IT security trends and technologies that are most likely to affect organizations in 2016, short discussion of sequences of the new cybersecurity bill and recommendations of security practices that should be followed in order not to put private data at risk. In January edition we’ve also included technical tips on how to detect who added a new file to the file server and what should be done first in situations when the exchange server is down. Don’t miss the top free professional tools for system administrators that help audit changes in Active Directory, file servers, Windows servers, and exchange server, and help troubleshoot account lockouts. 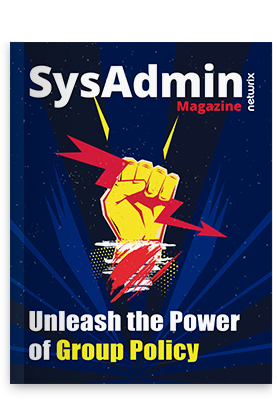 Read online version of Sysadmin Magazine or download it as a PDF document.